In the 50 years young mountain slide (dating to 1964) the first bouldering circuit of the Allgäu with 31 numbers could be found already since some years, which is situated in a beautiful mountain scenery. In the meanwhile the enormous potential of the area was developed and nowadays (2019) there are more than 870 problems in almost all grades to be found here. Through the area lead 5 circuits in the meanwhile (Yellow, Orange 2x Blue, Black) and additionally there do exist numerous isolated problems. Parking: In Hinterstein, parking fee 4,00 EUR / 24 h (as of 2018). Climate: North-east slope, in summer sunny almost the whole day, in the mid-seasons sun until about 3-4 PM, in the cold season sun only in the morning. Dries very quickly after rainfall! Rock: Dolomite and marl, climbing here feels like a mix of sandstone and gneiss. In the free standing part the terrain is very blocky. But with a good small roll-pad and an additional starter-pad most problems can be done alone, at least if you know what you are doing. With a big roll-pad and an additional starter-pad almost all problems are perfectly doable. For a handful very high boulders 2 big pads and a spotter are recommended. The problems on the very high boulders can also be checked out with a rope, in most cases there are bolts on top. In the woods the landing is much better than in the free standing part. Apart from some very high problems also most lines here can be done alone and with one crashpad. In some online-sites you will find statements, that you need at least 3 pads and numerous spotters, which is absolutely nonsense and not true at all! If you know bouldering areas in free nature in alpine terrain and if you know how to place a crashpad efficiently you will get along without problems in Hinterstein. On the way from the parking into the area you will pass the "Kiosk Petra Wechs", which can also be reached very fast during bouldering breaks. If you like cake you should not miss the daily fresh baked cakes here! To stop for a bite to eat in Hinterstein, virtually on the walk to the area there are the "Hintersteiner Stuben" (external link) to be found, or close to the parking the snack bar "Stüble auf der Höh". A bit further ahead back in the village the "Bergsteiger Hotel", the restaurant "Bergblick" or the "Prinze Gumpe" wait for hungry guests. On hot days the river Ostrach running next to the area promises a welcome cool down. On some high boulders you can also climb with a rope. There does exist one bolted route (which has also been done as a boulder) and there are bolts for toproping on the top of some boulders. The style of climbing in the area is very varied, from flat slabs with friction problems to huge roofs everything is to be found. Unlike in most bouldering areas of primary rock in the Alps the problems in Hinterstein are often a lot more technical. But don't think that you will not need power here, many problems are really steep and athtletic. The area is very blocky, some problems are very narrow. To avoid touching a neighbouring boulder is an important part of the difficulty for some problems. If you want to claim a correct ascent, you have to make sure not to touch a neighbouring boulder if this is not marked with a coloured dot and so "added" to the problem. - Some standing starts have to be started from the block marked with a dot (same colour as the problem). - Sitting starts start WITHOUT a thick crashpad, a thin sitting-pad can be okay. - Sitting starts start with both hands exactly on the marked holds. - For a sitting start the stern is the last part to leave the ground. - For this do not "hop" from the ground or out of the pad, but lift stably and only then do the first move! A circuit marked with yellow colour offers a rich field of acitvity for beginners. When climbing through the 107 problems you will have to do about 400 metres of climbing while crossing more than half of the blockfield. If you are looking for something more demanding, the next level is an orange circuit with 78 problems. If you are looking for something even more difficult there are 2 blue ciurcuits with 70 and 67 problems. Circuit no. 5 begins where circuit no. 4 ends, so both circuits can be connected easily to 137 numbers. If this is still not enough, there are not only problems in circuits but also many individual problems to be found. You will find many of these in the free standing part of the boulder field, but also many in the bordering forest. 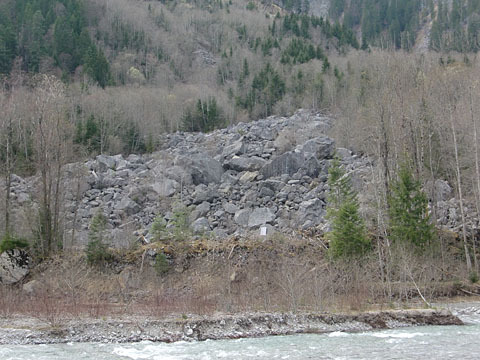 There you will find plenty of huge boulders offering many excellent problems. And the great thing about that: the terrain in the forest is a lot less blocky than the free standing part of the talus. With other words: The landing here is often much better. On the other hand the boulders are lying not close together as in the other parts and sometimes you will have to search a little bit to find these excellent boulders lying a bit off the beaten track. View from the boulder field towards "Hinteres Dorf Hinterstein"
The beautifully situated rear part of the village Hinterstein, the so called "Hinteres Dorf Hinterstein" in a wide and sunny basin surrounded by high mountains [pic 1], for the access to the area you will cross the "Ostrach" [pic 2], then turn to the right to the beginning of the talus a bit further. The chaos of boulders viewed from the hiking path [pic 3]. 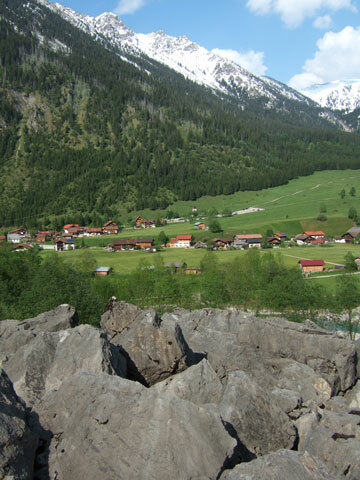 Picture 4 is taken in the middle of the boulder field and shows the chaos of boulders; on the right border of the photo the houses of Hinterstein. A bit harder is the also very overhanging "Mjölnir" (8a+/b), also in the sector "Wald unten". "Chalk Desire" (7c+) in the sector "Wald oben" is entirely a bit easier but waits with a very hard crux move. "Drag & Drop" (8a) in the lower part of the main sector requires a solid finger strength, no mega athletic power needed here, but for smaller climbers also helpful for the far moves. Photos: "Yggdrasil" (original method) in the sector "Hauptfeld unten". Now a much easier method was found so that the difficulty of the problem is reduced to the first move which is about 7c+. You will find almost everyting in the area, short and easier problems as "Nimm Daas" (5+) in the sector "Wald unten" [pic 1] or a lot harder like "Squeezer" (7a+) in the lower part of the main sector [pic 2]. A good bit higher is the excellent arête "On Fire" (7b) in the lower part of the main sector [pic 3]. "Goldrush" (7c+) on the same boulder in the main sector is very overhanging and requires a good body power and strong fingers as well. Lower part of the main sector - A good technique helps a lot for the "Murmelebraten" (5) [pic 1]; The powerful "Gladiator" (7a+) [pic 2] requires also a certain flexibility; "Kreidezeit" (7a+/b) [pic. 3] waits with small crimps and requires also a good shoulder power . Lower part of the main sector - The flat slab of the yellow no. 57 (PD) [pic 1] is pure joy for experts but already a interesting problem for beginners; "On Air" (7a) [pic 2] is a short but hard problem. A problem with a nice view is the blue no. 20 "Kantate" (4-) in the lower part of the main sector [pic 1]. Technical, tricky and requiring a good finger strength: "Marmite" (6c+) [pic 2 and 3]. If you like a bit more airy problems you will like the slab "Bigfoot" (4) in the lower part of the main sector [pic 1]. 2 very good, technical and powerful problems are "Hebinix" (6b+) [pic 2] and "Troubadix" (6b) [pic 3] also in the lower part of the main sector. Main sector lower part - "Die Glorreichen 2" (5-) [pic 1] is one of the numerous overhanging problems of a moderate height in the area. "BiBaBouldermann" (5+) [pic 2] is very short but nevertheless interesting and not so easy. One of the kinglines in the area is the high arête "Orca" (7c) in the sector "Wald mitte"; powerful moves and technical hard sequences in steep terrain are waiting for you. Sector "Wald mitte" - Keep cool for "Boulder Highway" (5+/6a) [pic 1], in the slab the holds are not very good also in the upper part. The so called "Filmriss" (4) [pic 2] could happen if falling down here, but there are good holds all the way up this high and striking crack. Sector "Wald mitte" - Not super high but with a very far, hard shoulder move waits "Master Summoner" (7b) [pic 1]. The prominent arête "Master Doorkeeper" (5-) [pic 2] is quite technical with an interesting "open door effect". A new problem in the sector "Wald mitte" [pic 1] with a very athletic start. An excellent boulder in the sector "Wald oben" with the slightly overhanging wall of "Megalon" (6c)-powerful climbing on edges with far moves [pic 2]. Hard compression moves starting from the ground in the slightly overhanging wall of "Midgard" (6c+) in the sector "Wald oben" [pic 1]. Right next to it: "Thumbstone" (7a) [pic 2] which is even a bit harder. "Bifröst SD" (6c+) in the sector "Wald mitte" [pic 1 and 2] is one of the numerous problems turning up suddenly in the dense mountain forest; very varied, technical and not really low.